This loft bedroom with its two bunk beds has a low wall that looks out into the vaulted Living Room with a Fireplace. 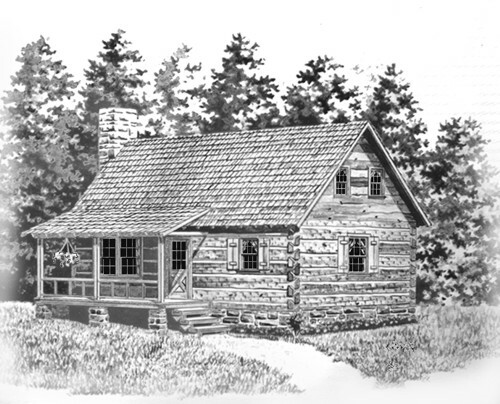 This quaint little Log Cabin can be built as a log home or as a framed home with wood siding. The stairway is open to the Living and Dining Room. The loft bedroom with its two bunk beds has a low wall that looks out into the vaulted living area. Bedroom-1 is near the full bath. A full kitchen is located under a shed roof at the rear. Chinked, pine 6x12 logs are used in this log cabin, but your log supplier can substitute another type log style. The alternate frame plan, F-780-A, adds an alternate half bath upstairs. The kitchen is extended and a small utility/mud room opens to a rear porch. When you purchase the log version L-780, the alternate frame version, F-780-A, is included for the same price.